Microgaming invites all of its players to experience the extravagant lifestyle through this video slot machine, Riviera Riches. The fancy living aspects are detected by players as soon as the game screen loads as all of the symbols as well as the design of the game’s interface are inspired by that theme. These symbols appear on the video slot’s 15 lines and five reels. They include a roulette wheel bonus symbol, a rich man smoking a cigar, a wine glass, a fancy vintage car, the logo of the game, card symbols, stacks of dollars and golden coins, a rich lady drinking wine and a big mansion. 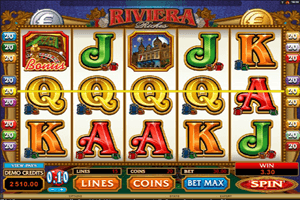 Play Riviera Riches Slot here. All of these icons some in great graphics and the game itself comes with an alluring soundtrack that depicts the lifestyle of the rich and famous. Once players have selected how many lines they want to activate and choose the number of coins and the value of the coins, they will be able to start the game by clicking on the spin button. Players can earns payouts by getting matching symbols on the winning lines or through the help of the bonus and special features of the slot. Players can check all of them out at the paytable of the game by clicking View Pays. The game has a roulette Bonus round which is triggered when players get the roulette wheel on the 1st and the 5th reel. Players will spin the roulette wheel after placing bets at the wagering area, just like a roulette game. The logo is the game is wild and can replace other symbols. The scatter money can trigger the free spins round.